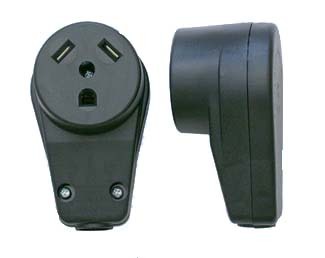 This female RV connector is used to replace worn out molded female ends on adapters, surge protectors, and extension cords without having to replace the whole product. It is made out of a high impact nylon, and heavy-duty highly conductive metal parts, which is better suited to handle the heat created by heavy loads than that of the molded-on variety. The sleek, compact design makes installation straightforward and easy. 30 amp model accommodates 10/3 STW-type wire. For outdoor use. 1 year warranty.